The generation of high-affinity Abs is essential for immunity and requires collaboration between B and T cells within germinal centers (GCs). By using novel mouse models with a conditional deletion of the p110δ catalytic subunit of the PI3K pathway, we established that p110δ is required in T cells, but not in B cells, for the GC reaction. We found the formation of T follicular helper (TFH) cells to be critically dependent on p110δ in T cells. Furthermore, by deleting phosphatase and tensin homolog deleted on chromosome 10, which opposes p110δ in activated T cells, we found a positive correlation between increased numbers of TFH cells and GC B cells. These results are consistent with the hypothesis that T cell help is the limiting factor in the GC reaction. P110δ was not required for the expression of B cell lymphoma 6, the downregulation of CCR7, or T cell entry into primary follicles. Instead, p110δ was the critical catalytic subunit for ICOS downstream signaling and the production of key TFH cytokines and effector molecules. Our findings support a model in which the magnitude of the GC reaction is controlled by the activity of the PI3K pathway in TFH cells. After exposure to Ag via immunization or infection, B cells have the capacity to generate plasma cells and develop an extrafollicular response or, together with follicular dendritic cells, initiate the germinal center (GC) reaction (1). The GC is a microanatomical structure formed in B cell follicles in secondary lymphoid organs where Ag-specific B cells undergo division, isotype switching, somatic hypermutation, and differentiation into memory B cells or plasma cells. Cognate interaction between B and T cells in the GC is essential for the selection of high-affinity Ag-specific B cells, and access to T cell help is thought to be a limiting factor for the positive selection of GC B cells (2). The PI3K pathway has been implicated in lymphocyte development and activation. It transduces extracellular signals into the production of the second messenger phosphatidylinositol 3,4,5-trisphosphate (PIP3) by phosphorylation of phosphatidylinositol 4,5-bisphosphate. In lymphocytes, PIP3 is generated by the class I PI3K catalytic subunits of which there are four isoforms named α, β, δ, and γ. The α, β, and δ enzymes form heterodimers with one of five Src homology 2 domain-containing regulatory subunits termed p85α, p85β, p55γ, p50α, and p55α, which mediate recruitment to phosphotyrosine-containing signalosomes (3). The levels of cellular PIP3 are also regulated by phosphatases: phosphatase and tensin homolog deleted on chromosome 10 (PTEN) directly opposes PI3K by removing the 3′ phosphate from PIP3; the SHIP enzymes generate the second messenger, phosphatidylinositol 3,4-bisphosphate. Mice with germline mutations of the p110δ catalytic subunit have demonstrated its importance for the GC reaction. However, it remains unclear whether this is a reflection of the requirement for p110δ in B cells, T cells, dendritic cells (DCs), or other cell types required for the GC response (4, 5). B cells from p110δ-deficient mice display in vitro defects in survival and proliferation that correlate with defective signal transduction following stimulation with Abs via the BCR or CD19 (6–8). Whether these in vitro defects are relevant in vivo is unclear since B cell-specific deletion of PTEN impaired class-switch recombination but not the magnitude of the GC response (9). T cell-specific deletion of the class IA regulatory subunits showed that the GC reaction and Ag-specific Ab titers were reduced, implicating a T cell-intrinsic requirement for class IA PI3K but leaving unresolved the nature of the relevant catalytic subunits (10). Using the p110δD910A mouse model, which carries a point mutation that renders p110δ catalytically inactive, adoptive transfer experiments revealed impaired Th1/Th2 cytokine production and a 2-fold reduction in clonal expansion (5, 11). In contrast, T cell-specific deletion of PTEN removed the requirement for CD28 costimulation (12) and allowed enhanced IL-4 production (13). Gaining a better understanding of the cell intrinsic role for p110δ in Ab responses should prove helpful in determining the mechanism of action of small molecule p110δ inhibitors. This is timely, as these inhibitors have shown promise in animal models of inflammatory and autoimmune disease (14, 15), and human studies have been initiated. There is an increasing understanding of the nature of GC T cells that are synonymous with the specialized population of T cells called T follicular helper (TFH) cells (reviewed in Refs. 16 and 17). This T cell subset represents a novel lineage of effector T cells that is critical for the provision of help to B cells during an immune response (18). The development of TFH cells is dependent on the presence of Ag-specific B cells and the transcriptional repressor B cell lymphoma 6 (Bcl-6) (19–21). A defining characteristic of TFH cells is their high expression of the chemokine receptor CXCR5 that allows migration along a gradient of CXCL13 into the B cell follicle (22). Recently, ICOS-mediated PI3K signaling has been shown to be an essential regulator of TFH cell numbers and cytokine production (23). In this study, we show that, unexpectedly, p110δ activity in B cells is not necessary for the formation or magnitude of the GC response and that the essential function of p110δ in the GC reaction is the T cell-intrinsic regulation of TFH cell formation and function. Moreover, we demonstrate that the p110δ subunit is pivotal for ICOS function, thereby acting as a key regulator of the TFH cell lineage at the level of intracellular signaling. The importance of the PI3K pathway in TFH cells is underscored by our finding that the magnitude of PI3K signaling in T cells regulates TFH cell numbers, the numbers of GC B cells, and the number of high-affinity Ab-secreting cells produced upon secondary immunization. The pik3cd targeting vector was generated using standard methodology. A single LoxP site was introduced into the XhoI site upstream of the first coding exon. A neomycin cassette flanked by FRT sites and a single LoxP site (FRTneoFRT) was inserted into the EcoRV site between exons 9 and 10. Targeted E14 ES clones were identified by Southern blot analysis of EcoRV digests, which yielded a 5.6-kb fragment for nontargeted clones and a 4.2-kb fragment for targeted clones. FLPe was transiently expressed to mediate recombination excision of the neomycin cassette, which was verified by Southern blot analysis. One of the correct clones was selected and injected into blastocysts to produce chimeric mice containing LoxP-flanked exons 1–9 encoding the first 490 aa of p110δ, which will be deleted in the presence of cre. Conditional deletion was achieved by crossing with CD19cre, CD4cre, or Ox40cre mouse strains. Germline p110δ−/− mice were described previously (4). Mice were backcrossed at least five times to C57BL/6. Mice with a conditional allele of PTEN, p110δD910A mice, OT-II transgenic RAG−/− background mice, and anti-hen egg lysozyme (HEL) Ig transgenic mice have been described previously. All mice were bred at the Babraham Institute Small Animal Barrier Unit. Animal husbandry and all procedures involving animals were approved and performed according to United Kingdom Home Office and local Ethical Review Committee guidelines. Genomic DNA was prepared using cell lysis and proteinase K digestion (Gentra/Qiagen, Crawley, U.K.). Quantitative PCR was performed to determine the recombination efficiency of genomic DNA using a JOE-labeled probe within exon 2 and a FAM-labeled probe within exon 18 (Supplemental Fig. 1B): p110δ forward exon 18, 5′-CACAGGTCTCATCGAGGTGGTC-3′; p110δ reverse exon 18, 5′-TGGACTTGAGCCAGTTGAGCA-3′; p110δ probe (FAM) exon 18, 5′-CTCGGACACCATCGCCAACATCC-3′; p110δ forward exon 2, 5′-AGCAGCAGGAGTTGGAGGATG-3′; p110δ reverse exon 2, 5′-CCAATGAGGAGGCTGATCTGG-3′; and p110δ probe (JOE) exon 2, 5′-CGACATCCAGCCCTTCCTGCCC-3′. RNA was extracted from cells using TRIzol (Invitrogen, Carlsbad, CA). DNAse-treated RNA was reverse transcribed using SuperScript II (Invitrogen). Quantitative RT-PCR was performed using mRNA prepared from T cell blasts and quantified using Taqman probe assays (Applied Biosystems, Warrington, U.K.) and normalized to the expression of β2-microglobulin as 2−ΔΔCt. Mice were immunized i.p. with 100 μg of (4-hydroxy-3-nitrophenyl)acetyl (NP)19–keyhole limpet hemocyanin (KLH) or NP36-chicken γ-globulin (CGG) (Biosearch Technologies, Novato, CA) adsorbed to alum or 2 × 108 SRBCs (Harlan, Bicester, U.K.) in saline. Mice were bled at indicated time points before boosting with soluble Ag. In adoptive transfer experiments analyzing T cell help to B cells, 105 OT-II or p110δD910A OT-II T cells isolated from lymph nodes together with 106 carrier C57BL/6 B cells were injected i.v. into recipient B6 mice and recipients were then i.p. immunized with 100 μg of NP13-OVA (Biosearch Technologies) adsorbed to alum. Adoptive transfer experiments into C57BL/6 or p110δ−/− recipient mice were performed as described above using 3 × 105 OT-II T cells per recipient mouse. Single-cell suspensions were prepared from lymphoid tissues and the peritoneal cavity. Abs against the following surface markers were used: B220, CD4, CD5, CD8, CD21, CD23, CD95, CXCR5, CCR7, ICOS, IgM, programmed cell death 1 (PD-1; BD Biosciences), peanut agglutinin (PNA)-FITC (Vector Laboratories, Peterborough, U.K.), and streptavidin conjugates (eBioscience, Hatfield, U.K.). Dead cells were excluded using DAPI staining. Cells were collected using an LSRII or FACSCalibur (BD Biosciences, Oxford, U.K.) and analyzed using FlowJo software (Tree Star, Ashland, OR). To purify GC cells, B220+CD95+cells were FACSAria-sorted from mice at days 7 and 10 following NP-KLH immunization. To detect CD40L after stimulation, splenocytes were stimulated in vitro using plate-bound anti-CD3 (2C11) at 1 μg/ml and anti-CD28 (37.51) at 10 μg/ml for 5 h, and anti-CD40L-PE (eBioscience) was added for the last 2 h of culture. Five-micrometer spleen sections were fixed in ice-cold acetone and blocked before incubation with biotinylated primary Abs followed by streptavidin-Alexa 555 (Invitrogen) and then PNA-FITC. The sections were mounted using Aqua-Poly/Mount (Polysciences, Northampton, U.K.). An Olympus IX81 wide-field epifluorescence microscope was used for imagining at ×10–×20 magnification with an Olympus ×10 UPLFL (universal plan fluorite) NA 0.3 objective, and images were taken with a Hamamatsu ORCA ER digital camera at room temperature. Color conversion was performed by the Olympus cell software, and minor adjustments were made using Adobe Photoshop. Five images per mouse were taken, and the numbers of B cell follicles and PNA+ GC structures were enumerated. For quantification of CD4+ cells within the B cell follicle and GC, sections were stained with anti-IgD Alexa 647, PNA-FITC, CD4-bio, and tetramethylrhodamine isothiocyanate-labeled streptavidin (Jackson ImmunoResearch Laboratories, Newmarket, U.K.). Five fields of view were captured per mouse, and the number of CD4+ cells in the GC (PNA+ and IgD− areas) was determined by counting cells relative to a defined area (μm2) using Volocity software (Improvision, Coventry, U.K.). Naive lymph node CD4+ T cells were FACSAria-sorted to >95% purity. CFSE-labeled, naive CD4+ T cells (105) were differentiated for 4.5 d in the presence of plate-bound 1 μg/ml anti-CD3, soluble 1 μg/ml anti-CD28, 10 μg/ml anti-IFN-γ (RA-6A2), 10 μg/ml anti-IL-4 (11-B11), and 100 ng/ml IL-6 (PeproTech, London, U.K.) in IMDM media. For intracellular flow cytometry of IL-21, the cells were stimulated with phorbol dibutyrate (50 ng/ml) and ionomycin (500 ng/ml) for 6 h, and 10 μg/ml brefeldin A was added for the last 2 h. The cells were stained using anti–IL-21–allophycocyanin (R&D Systems, Abingdon, U.K.) according to the manufacturer’s protocol. The IL-21+ cells were defined by quadrant gates set using the isotype control staining and the undivided peak of CFSE-labeled cells. CD4+ T cells were purified by MACS and cultured for 2 d in the presence of plate-bound 10 μg/ml anti-CD3 and soluble 1 μg/ml anti-CD28 and then rested in media for 1 d. The cells were restimulated with 0.5 μg/ml anti-CD3, 2 μg/ml anti-ICOS, and 20 μg/ml anti-hamster IgG for 6 h.
Anti-HEL Ig transgenic B cells were isolated from wild-type and p110δ−/− mice using a MACS B cell isolation kit (Miltenyi Biotec, Bisley, U.K.) according to the manufacturer’s protocol (purity >95% B cells). B cells were cultured with increasing doses of HEL (Sigma-Aldrich, Poole, U.K.) and the I-Ak–restricted HEL-responsive 2G7 T cell line for 24 h at 37°C (24). The quantity of IL-2 secreted by 2G7 cells was measured by ELISA according to the manufacturer’s protocol (R&D Systems). ELISA plates (Nunc, Paisley, U.K.) were coated with NP23-BSA or NP33-BSA, or for high-affinity measurement NP2-BSA, or NP3-BSA at 10 μg/ml in carbonate buffer, washed, and blocked. Serum samples were serially diluted and bound Ig was detected using biotinylated anti-IgM or IgG1 and HRP-conjugated streptavidin (SouthernBiotech, Birmingham, AL). Endpoint titers were calculated to give a measure of relative Ab concentration. For ELISPOT, MultiScreen HA mixed cellulose ester plates (Millipore, Watford, U.K.) were coated with NP23-BSA, or NP2-BSA, in PBS, washed, and blocked before applying serially diluted cells and incubating overnight. Detection was performed using biotinylated IgG1 (SouthernBiotech) and alkaline phosphatase-conjugated streptavidin (R&D Systems) and 5-bromo-4-chloro-3-indolyl phosphate/NBT substrate (R&D Systems), and the numbers of Ab-forming cells (AFCs) were quantified using AID software (Autoimmun Diagnostika, Strasburg, Germany). CD4+ T cells from C57BL/6 or p110δ−/− mice were MACS-purified and stimulated by anti-CD3 (10 μg/ml) and anti-CD28 (1 μg/ml) for 2 d and then replated in IL-2 (10 ng/ml) (PeproTech) for 2 more days. Before stimulations, the CD4+ T blasts were rested at 37°C for 30 min. Stimulations were performed by adding anti-CD3 and anti-ICOS (C398.4A BioLegend, San Diego, CA), which was cross-linked with 20 μg/ml anti-hamster-IgG (Jackson ImmunoResearch Laboratories). Stimulated cells were boiled in reducing buffer and resolved on 12.5% SDS-PAGE gels. p-Akt (193H12), phosphorylated glycogen synthase kinase 3 (GSK3)α/β, total Akt (40D4), and GSK3α/β (Cell Signaling Technology, Hertfordshire, U.K., or Santa Cruz Biotechnology, Calne, U.K.) were developed using anti-rabbit IRDye 680 or anti-mouse IRDye 800 (LI-COR, Lincoln, NE). The membranes were scanned using the LI-COR system, and the integrated intensity was quantified using the Olympus software. Statistical analysis was performed using a nonparametric Mann-Whitney U test, paired t test, or nonparametric ANOVA using Graphpad Instat3 software (GraphPad Software, San Diego, CA). Significance is indicated by *p < 0.05, **p < 0.01, and ***p < 0.001. As p110δ is expressed by most cells in the immune system, we used Cre/LoxP technology to identify the cell types that depended on p110δ in the GC reaction. Deletion of p110δfl/fl in T cells using CD4cre (T p110δfl/fl mice) was highly efficient and resulted in a modest reduction in the number of T cells in the spleen, but it did not affect the number of T cells in the lymph nodes (Supplemental Figs. 1, 2). 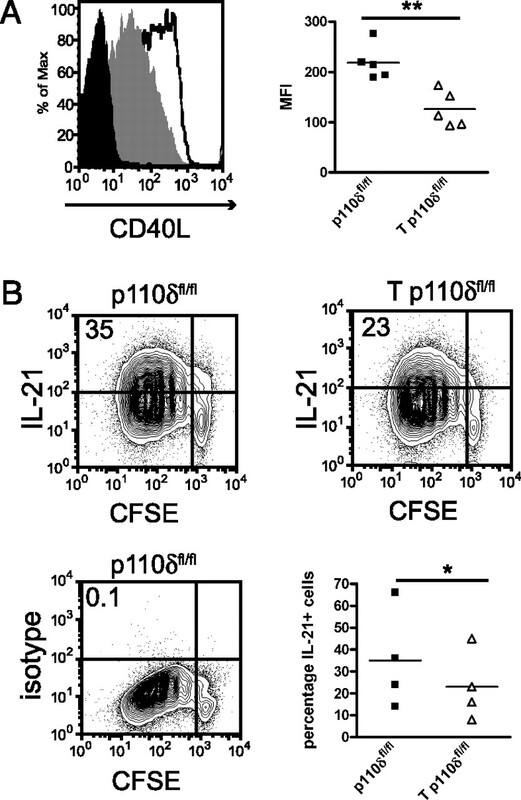 As T lymphocytes are essential for the GC response (25), we evaluated the contribution of p110δ in T cells by immunizing T p110δfl/fl and littermate control p110δfl/fl mice that are CD4cre−. Following immunization with NP-KLH, the number of CD95+B220+ GC B cells was reduced ∼7-fold in T p110δfl/fl compared with control mice at the peak of the GC reaction (Fig. 1A). Also, the ratio of GCs per B cell follicle was significantly reduced (Fig. 1B). In the primary immune response, the NP-specific IgG1 titers detected by binding to highly haptenated BSA (e.g., NP33-BSA) were only slightly decreased in T p110δfl/fl mice. In contrast, the high-affinity NP-specific IgG1 response, detected by binding to lightly haptenated BSA (e.g., NP3-BSA), was severely impaired, showing that affinity maturation was defective in T p110δfl/fl mice (Fig. 1C). To elucidate the role of p110δ in T cells for the generation of a secondary memory response, we boosted the p110δfl/fl and T p110δfl/fl mice using soluble Ag 42 d after primary immunization. Following booster immunization there was no increase in high-affinity Ab, indicating that immunological memory was defective (Fig. 1D). In agreement with this, ELISPOT analysis of NP2- and NP23-binding AFCs in the spleen and bone marrow showed a marked decrease in the number of IgG1-secreting AFCs (Fig. 1D, 1E). To determine whether the enzymatic activity of p110δ is required in a T cell-intrinsic manner for provision of help to B cells, we adoptively transferred catalytically inactive p110δD910A or control wild-type OVA-specific OT-II transgenic T cells into C57BL/6 recipient mice and immunized with NP-OVA. The resulting NP-specific IgG1 titers were 3- to 4-fold lower in recipients of p110δD910A OT-II T cells than in recipients of wild-type OT-II T cells (Fig. 1F). This indicates that the catalytic activity of p110δ is required for T cells to provide optimal help to B cells. Thus, p110δ function is required by T cells for the generation of the GC reaction, affinity maturation, and memory B cells. Deletion of p110δ in T cells causes impaired humoral immunity. A, Flow cytometric analysis of CD95+B220+ GC B cells in the spleen day 10 after NP-KLH immunization. For A, B, D, and E, each symbol represents one mouse and horizontal bars indicate the mean. One of two independent experiments is shown. Nonparametric ANOVA statistical analysis was used for time courses displayed in C, D, and E. B, Histological analysis of the ratio of GC to B cell follicle in p110δfl/fl compared with T p110δfl/fl mice in the spleen day 10 after NP-KLH immunization. C, The means (±SD) for NP23-binding IgG1 titers, the high-affinity NP3-specific IgG1 titers, and the affinity maturation in p110δfl/fl (▪, n = 7) compared with T p110δfl/fl mice (△, n = 6). D, The mean high-affinity NP2-specific IgG1 titers (±SD) after primary NP-KLH immunization and day 7 after boosting with soluble NP-KLH in p110δfl/fl (▪, n = 3) and T p110δfl/fl mice (△, n = 6). The number of NP2 AFCs/106 BM cells and splenocytes day 7 after boosting. E, The mean NP23-specific IgG1 titers (±SD) from the experiment in D. The number of NP23 IgG1 AFCs/106 BM cells and splenocytes day 7 after boosting are displayed. F, B6 mice were immunized with NP-OVA and adoptively transferred with 105 OT-II cells isolated from wild-type (n = 6 recipients) or p110δD910A (n = 6 recipients) OT-II transgenic mice. The NP-specific IgG1 titers were analyzed at day 7, and the titers in mice that received no donor cells (n = 7 mice) are shown for comparison. BM, bone marrow. As T cells are known to be critical for the GC reaction (25), the TFH cell population was analyzed in T p110δfl/fl mice by flow cytometry using CXCR5- and PD-1–specific Abs. In T p110δfl/fl mice immunized with NP-KLH, the numbers of TFH cells were reduced compared with p110δfl/fl controls (Fig. 2A). To extend our analysis to a different Ag, we chose SRBCs, which elicit a robust ICOS-dependent expansion of CXCR5+ TFH cells (26). Four days after immunization with SRBC, TFH cell formation was severely impaired in T p110δfl/fl mice and, by day 6, the TFH cell population in these mice had returned to baseline (Fig. 2B). These data suggest that p110δ is required by TFH cells for their initial expansion or differentiation. Furthermore, the GC reaction elicited by SRBCs was impaired in T p110δfl/fl mice, as the number of B220+PNA+CD95+ cells was reduced at all time points tested (Fig. 2B), and the histological appearance of the spleen showed fewer and smaller GC structures in the SRBC- immunized T p110δfl/fl mice (data not shown). TFH cells and GC T cells are diminished in T p110δfl/fl mice. A, Flow cytometric analysis of CXCR5+PD-1+ TFH cells among CD4+ T cells in the spleen at day 10 following NP-KLH immunization of p110δfl/fl compared with T p110δfl/fl mice and the numbers of TFH cells. For A and C, each symbol represents one mouse, horizontal bars indicate the mean, and data are representative of two independent experiments. B, The number of CXCR5+PD-1+ TFH cells among CD4+ T cells and the absolute number of GC B cells in NI and on days 4, 5, and 6 after SRBC immunization are shown as mean (±SD) of four to five mice per time point in p110δfl/fl (▪) compared with T p110δfl/fl (△) mice. Nonparametric ANOVA. C, The number of CD4+ cells within B cell follicles or GCs was determined 5 d following SRBC immunization by immunofluorescence using mAbs to CD4 (red), IgD (blue), and PNA (green) (original magnification ×20). The left scatter plot shows the numbers of CD4+ cells in the B cell follicle per 0.01 mm2, and the right scatter plot shows the numbers of CD4+ cells per 0.01 mm2 of GC. D, Representative histograms of the MFI of CCR7 on PD-1−CD4+ T cells and TFH PD-1+CD4+ T cells day 4 after SRBC immunization. Isotype (black), T p110δfl/fl (gray), and p110δfl/fl (open) histograms. MFI, mean fluorescence intensity; NI, nonimmunized mice. TFH cells must form cognate interactions with B cells and, therefore, migration into the B cell follicle is important for TFH cell differentiation (21, 27). The numbers of CD4+ T cells in the B cell follicle were slightly lower in T p110δfl/fl mice compared with p110δfl/fl mice. However, the numbers of CD4+ T cells in the PNA+IgD− GC area were significantly reduced (Fig. 2C). Thus, the reduced number and size of GCs are reflected by reduced numbers of TFH cells. As CCR7 downregulation is essential for follicular entry and T cell help to B cells (27), we determined the levels of CCR7 on CD4+ T cells. The expression of CCR7 was higher on PD-1− T p110δfl/fl CD4+ T cells compared with p110δfl/fl, which is consistent with a previous study showing that p110δ regulated CCR7 on CD8+ T cells (28). We found that PD-1+ TFH cells downmodulated CCR7 on their surface similarly in T p110δfl/fl and p110δfl/fl mice (Fig. 2D). Taken together, these data suggest that CD4+ TFH cells residing in the GC were reduced in T p110δfl/fl mice, but this reduction is unlikely to be a consequence of failure to downregulate CCR7. Although the T p110δfl/fl mice revealed a T cell-intrinsic role for p110δ in the GC reaction, the initial observations on the severe defects GC formation and humoral immunity in the p110δ−/− or p110δD910A knock-in mice could also reflect a role for p110δ in APCs or B cells (4, 5). To determine whether p110δ plays a role in the initial priming of naive T cells by APCs, we used adoptive transfer of transgenic OT-II cells and NP-OVA immunization. The ability of wild-type OT-II T cells to stimulate the production of NP-specific IgG1 was assessed 7 d after adoptive transfer into C57BL/6 and p110δ−/− recipients (Fig. 3A). The NP-specific IgG1 titers were not significantly different between the two groups, suggesting that initial T cell priming by APCs is independent of p110δ and, moreover, that provision of extrinsic T cell help through adoptive transfer can rescue defects in humoral immunity in the p110δ−/− mice. The B cell-intrinsic role of p110δ in humoral immunity. A, In vivo priming of 3 × 105 OT-II T cells after adoptive transfer into B6 recipients (n = 7) or p110δ−/− recipients (n = 5) was measured as NP-specific IgG1 titers day 7 after transfer and NP-OVA immunization. B6 (n = 4) and p110δ−/− (n = 2) mice that did not receive donor cells are shown. For A–C, each symbol represents one mouse and horizontal bars indicate the mean. Data are representative of two independent experiments. B, Numbers of GC (B220+CD95+) B cells at days 7 and 14 following NP-KLH immunization. C, Mice were immunized with NP-CGG and analyzed for NP23-specific IgM at days 7 and 14, NP23-specific IgG1 at day 7, NP3-specific IgG1 at day 14, and NP23-specific IgE at day 14. D, Affinity maturation presented as the mean ratio (±SD) of the NP3 titer IgG1-to-NP23 titer IgG1 following NP-CGG immunization in p110δfl/fl (▪, n = 8) compared with B p110δfl/fl mice (□, n = 8). E, The mean high-affinity NP3 IgG1 titers (±SD) in p110δfl/fl (▪, n = 8) compared with B p110δfl/fl mice (□, n = 8) after primary NP-KLH immunization and at day 7 after boost using soluble NP-KLH. F, The deletion efficiency of CD19cre was determined by quantitative real-time PCR as the mean ratio (±SEM) of the cre-excised p110δ exon 2 to the nonexcised exon 18 using genomic DNA from FO B or GC B cells in B p110δfl/fl (n = 3–5 mice/group) days 7 and 10 after NP-KLH immunization. G, Ag presentation in vitro by anti-Hel Ig transgenic B cells from p110δ-sufficient (▪, n = 4) or p110δ−/− (□, n = 4) mice was measured as mean (±SD) IL-2 secreted by the HEL-responsive 2G7 T cell line. Nonparametric ANOVA. FO, follicular. To explore the B cell-intrinsic role of p110δ, we used CD19cre-mediated deletion of p110δ in B p110δfl/fl mice. Deletion was less efficient than that obtained with CD4cre but led to reductions in the number of marginal zone (MZ) and peritoneal B1, but not in follicular B cells (Supplemental Figs. 1, 2); this is a phenotype similar to germline p110δ knockout and p110δD910A mice. The absence of p110δ in B cells did not cause any reduction in GC B cell numbers after immunization (Fig. 3B). Following NP-CGG immunization, IgM and high affinity NP-specific IgG1 titers were not significantly decreased in the B p110δfl/fl mice compared with p110δfl/fl mice (Fig. 3C). However, we found that the Ag-specific IgE titers were increased 30-fold after immunization in B p110δfl/fl compared with p110δfl/fl mice (Fig. 3C). This is in agreement with evidence that PI3K negatively regulates IgE (29, 30) and indicates that this effect is B cell-intrinsic. In the B p110δfl/fl mice, there was a trend toward impairment in affinity maturation compared with p110δfl/fl mice (Fig. 3D), indicating that p110δ has a modest role in affinity maturation or the survival or functionality of plasma cells. Alternatively, the reduction in IgG1 may be secondary to the enhanced class-switching to IgE. Analysis of high-affinity NP-specific IgG1 titers after booster immunization showed no difference in memory response between B p110δfl/fl and p110δfl/fl mice (Fig. 3E). The GC imposes a powerful selective environment upon B cells, which should result in accumulation of p110δ-sufficient cells if this enzyme is critically required for GC B cell selection or survival. However, there was no significant increase in the proportion of nondeleted p110δ genomic DNA in sorted GC B cells analyzed 7 or 10 d after NP-KLH immunization compared with follicular B cells (Fig. 3F). MHC class II–mediated presentation of peptide Ag by B cells to GC T cells is essential for successful selection of high-affinity B cells. Therefore, we tested the ability of p110δ-deficient B cells to process and present Ag using an in vitro T cell stimulation assay. B cells from p110δ−/− mice bearing the anti-HEL Ig transgene (MD4) (31) showed an increased capacity to present Ag over a range of HEL concentrations compared with p110δ-sufficient controls (Fig. 3G). Taken together, these data suggest that p110δ in B cells plays an essential role in limiting class-switching to IgE, but it is dispensable for the GC response. The deletion of p110δ in developing T cells by CD4cre would be expected to influence early activation events that were dependent on this lipid kinase. To investigate whether p110δ was required for the GC reaction subsequent to the initial activation of T cells, we generated mice in which deletion of p110δ was mediated by OX40cre. The costimulatory molecule OX40 is expressed following TCR- and CD28-mediated T cell activation and has been found to be expressed on CXCR5+CD4+ T cells, suggesting that the OX40cre transgene will be expressed in TFH cells (32, 33). Following immunization, we analyzed TFH cell numbers at the peak of the GC reaction in the OX40cre-p110δfl/fl model and found that TFH cells were significantly diminished in these mice compared with p110δfl/fl controls (Fig. 4A). The number of GC B cells and the ratio of GCs to B cell follicles were concomitantly reduced (Fig. 4B). The B cell memory response was analyzed at day 7 after boosting in the OX40cre models. In the OX40cre-p110δfl/fl mice, the high-affinity Ab titers were modestly reduced and there was a significant reduction in the numbers of NP2-binding AFCs in the bone marrow and spleen (Fig. 5A). TFH cell numbers are regulated by p110δ and PTEN. A, Flow cytometric analysis of the percentage of CXCR5+PD-1+ TFH cells among CD4+ T cells in the spleen of p110δfl/fl compared with OX40cre-p110δfl/fl mice and the numbers of TFH at day 10 after NP-KLH immunization. For A–D, each symbol represents one mouse and horizontal bars indicate the mean. Representative data are from two independent experiments. B, The number of GC B cells and the ratio of GCs per B cell follicle in the spleen of p110δfl/fl compared with OX40cre-p110δfl/fl mice day 10 after NP-KLH immunization. C, Flow cytometric analysis of the percentage of CXCR5+PD-1+ TFH cells among CD4+ T cells in the spleen of PTENfl/fl compared with OX40cre-PTENfl/fl mice at day 10 after NP-KLH immunization. D, The number of GC B cells and the ratio of GCs per B cell follicle in the spleen of PTENfl/fl compared with OX40cre-PTENfl/fl mice day 10 after NP-KLH immunization. E, The number of GC B cells and TFH cells in individual mice at day 10 following NP-KLH immunization. Each symbol represents an individual mouse of the following genotypes: Ox40cre-PTENfl/fl (black), p110δfl/fl and PTENfl/fl (dark gray), Ox40cre-p110δfl/fl (gray), and T p110δfl/fl (light gray). Memory B cells and long-lived plasma cells are regulated by p110δ and PTEN activity in effector T cells. A, The high-affinity NP2-specific IgG1 titers in p110δfl/fl compared with OX40cre-p110δfl/fl mice and the number NP2 AFCs/106 BM cells and splenocytes measured at day 7 after boosting with soluble NP-KLH. B, The high-affinity NP2-specific IgG1 titers in PTENfl/fl compared with OX40cre-PTENfl/fl mice and the number of NP2 AFCs/106 BM cells and splenocytes measured at day 7 after boosting with soluble NP-KLH. BM, bone marrow. The enzymatic function of p110δ is directly opposed by the lipid phosphatase PTEN that converts PIP3 to phosphatidylinositol 4,5-bisphosphate. Deletion of PTEN is associated with hyperresponsiveness of cells to stimulation and malignant transformation (13). To understand the contribution of PTEN in TFH cells, we again used the OX40cre system. Following immunization of OX40cre-PTENfl/fl mice, the TFH population was increased ∼3-fold compared with PTENfl/fl control mice (Fig. 4C). The number of GC B cells was also significantly increased and there was a trend toward a higher ratio of GCs per B cell follicle (Fig. 4D). In the OX40cre-PTENfl/fl mice, the high-affinity Ab titers were increased and the numbers of NP2-binding AFCs tended to be higher (Fig. 5B). 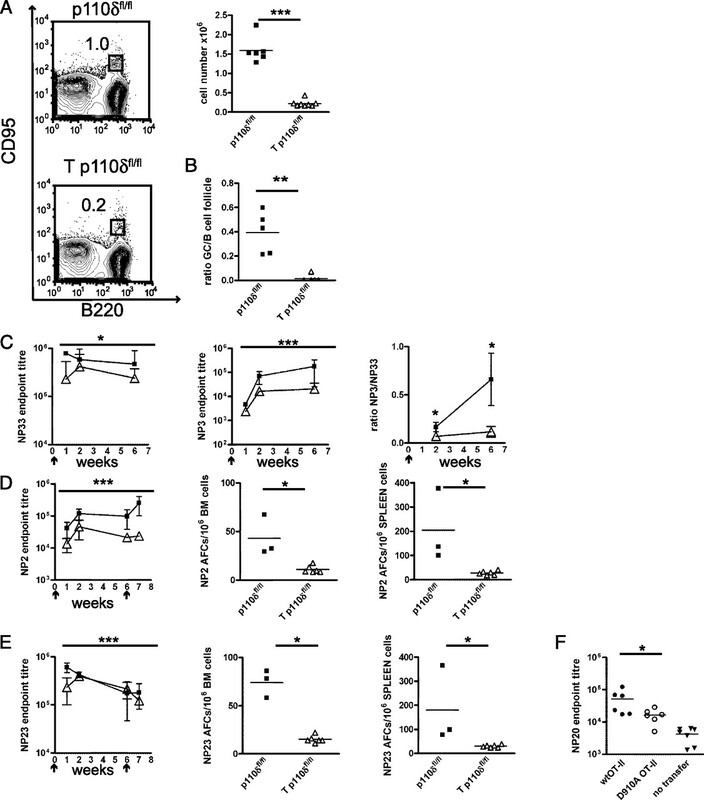 PI3K activity in T cells and the subsequent effect on TFH cell numbers are highly correlated with GC B cell numbers in the T p110δfl/fl and OX40cre mouse models (Fig. 4E), suggesting that PI3K activity in T cells determines the magnitude of the GC response. Thus, the GC reaction and subsequent effects on B cell memory function is influenced by the amount of PI3K activity in T cells. The CD40–CD40L receptor–ligand pair is of crucial importance for the GC reaction, and regulation of CD40L expression on activated T cells is central to controlling this molecular interaction (34). We therefore measured the level of CD40L expressed by T p110δfl/fl CD4+ T cells following in vitro stimulation and found it reduced ∼2-fold compared with p110δfl/fl mice (Fig. 6A). IL-21 production is a major effector function of TFH cells, and this cytokine plays a crucial role in GC B cells for generation of long-term humoral immunity and Bcl-6 expression (35, 36). The IL-21 production induced by CD4+ T cells differentiated in the presence of IL-6 was reduced in in vitro cultures using T p110δfl/fl compared with p110δfl/fl cells (Fig. 6B). These results suggest that the defects in CD40L and IL-21 in p110δ-deficient T cells could contribute to the impairment in humoral immunity in T p110δfl/fl mice. TFH cell effector molecules are regulated by p110δ. A, Representative histogram of the MFI of CD40L on CD4+ T cells after in vitro anti-CD3 and anti-CD28 stimulation. The isotype control staining is shown in black, T p110δfl/fl in gray, and p110δfl/fl in the open histogram. The scatter plot shows individual CD40L MFI values in p110δfl/fl (n = 5) and T p110δfl/fl (n = 5) mice. B, The frequency of IL-21–producing cells after in vitro differentiation is shown as contour flow cytometry plots with dilution of CFSE used to monitor cell division. The percentages of IL-21+ cells from four independent experiments using naive CD4+ T cells from p110δfl/fl or T p110δfl/fl are shown, and paired t test was used for statistical analysis. MFI, mean fluorescence intensity. TFH cell development and maintenance has been linked to the CD28-related costimulatory molecule ICOS, which was originally identified as being highly expressed on human GC T cells (37). ICOS-deficient mice (26) and ICOS ligand-deleted B cells (38) have revealed the crucial importance of this costimulatory molecule for formation of TFH cells. Additionally, the sanroque mouse, which exhibits expansion of the TFH cell population, has enhanced expression of ICOS (39). The intracellular tail of ICOS is associated with PI3K activity (40), and ICOS signaling is impaired after treatment with non-isoform–selective PI3K inhibitors (41). Recent data have revealed that mutation of the tyrosine motif in the cytoplasmic tail of ICOS that recruits PI3K regulatory subunits leads to a severe impairment in TFH cell numbers (23). To explore the role of p110δ in ICOS signaling, we generated CD4+ T cell blasts from p110δ−/− and C57BL/6 mice with equivalent ICOS expression (data not shown). Stimulation of these T cells with a suboptimal dose of anti-CD3 in combination with anti-ICOS Ab allowed the effect of ICOS activation on the phosphorylation of Akt (protein kinase B) to be analyzed as a read-out for the activity of the PI3K pathway. Following activation in this way, the phosphorylation of Akt was strong and sustained in wild-type CD4+ T cells but was barely detectable in p110δ−/− T cells (Fig. 7A). Furthermore, the unresponsiveness of p110δ−/− CD4+ T cell blasts was evident over a range of concentrations of ICOS Ab (Fig. 7B). To substantiate the observations with p110δ−/− CD4+ T cells, we examined the effect of the p110δ isoforms-selective PI3K inhibitor IC87114 on ICOS signaling in T cell blasts from C57BL/6 mice. This inhibitor mimicked the defect in ICOS signaling seen in p110δ−/− T cells (Fig. 7C). To further explore the role of p110δ in ICOS downstream signaling, we analyzed the constitutively active kinase GSK3 that is phosphorylated and thereby inhibited by p-Akt. We found that the levels of phosphorylation of the isoform GSK3β was reduced in p110δ−/− T cell blasts compared with B6 after ICOS-stimulation (Fig. 7D). ICOS downstream signaling is dependent on p110δ. For A–D, CD4+ T cell blasts were stimulated with anti-CD3 and anti-ICOS and cross-linked using anti-hamster IgG and the i.i. of p-AktS473 or GSK3αS21 or pGSK3βS9, and total Akt or GSK3α or GSK3β was determined by Western blot. The mean and SD i.i. of the phosphorylated protein was normalized to i.i. of the total protein (n = 3 independent experiments). The dotted line represents the baseline levels. Nonparametric ANOVA statistical analysis used for multiple measurements displayed in A–D. A, Time course of stimulation and (B) titration of anti-ICOS Ab concentrations and (C) time course of stimulation using B6 CD4+ T cells blasts pretreated with 1 μM IC87114. D, p-GSK3 and total GSK3 during a time course of stimulation. E, The levels of IL-21, IL-4, c-Maf, Bcl-6, and Blimp-1 mRNA after ICOS-dependent restimulation were detected by RT-PCR. The mean (±SD) amount of mRNA relative to β2-microglobulin as 2−ΔΔCt for p110δfl/fl (filled bars, n = 3) and T p110δfl/fl (open bars, n = 4) mice. i.i., integrated intensity. To further explore the role p110δ in ICOS signaling, we restimulated ICOS-expressing T cell blasts in vitro with anti-CD3 and anti-ICOS and measured selected cytokine and transcription factor mRNAs in these cells. The transcription factor c-Maf (42) is known to be induced by ICOS (43). In T cells lacking p110δ, the amount of c-Maf, IL-21, and IL-4 mRNA was reduced compared with control p110δfl/fl T cells, showing that p110δ is crucial for ICOS-dependent gene expression (Fig. 7E). The mRNA levels of the mutually antagonistic transcriptional repressors Bcl-6 and B lymphocyte-induced maturation protein 1 (Blimp-1) were analyzed after ICOS restimulation. Bcl-6 was induced by ICOS restimulation in p110δfl/fl T cell blasts, but in the T p110δfl/fl blasts Bcl-6 expression was already high. Blimp-1 expression in CD4+ T cell blasts has previously been shown to be lower in stimulated CD4+ T cells from p110δD910A mice compared with controls (44), and we found that Blimp-1 mRNA levels were also lower in T p110δfl/fl blasts after ICOS restimulation (Fig. 7E). In this study, we show that the essential cell-intrinsic role of p110δ required for the GC reaction to proceed resides within T lymphocytes. Moreover, our results suggest that the activity of the PI3K pathway in T cells is a critical determinant of GC size and output. The numbers of GC B cells was dependent on PI3K activity in T cells, which is compatible with the idea that access to TFH cell-mediated help is a limiting factor in the GC (2). In contrast, when the GC defect is primarily B cell-intrinsic, such as in the IL-21–deficient mice, there is an excess of TFH cells per Ag-specific GC B cell (36). The correlation between GC B cell and TFH cell numbers was also related to humoral memory, since a reduction in GC B and TFH cells was accompanied by impairments in the memory response, whereas the larger GC cellularity correlated with increased high-affinity Ab titers. Thus, PI3K activity in T cells determines the number of GC B cells and the magnitude of the memory response in a non-cell–autonomous manner. Previous studies, such as on the heart, have emphasized the cell-autonomous role of the PI3K pathway in determining organ size in mammals (45). This is a novel example of PI3K activity determining cell population size as a consequence of regulating signaling in T cells. When extrinsic T cell help was provided, p110δ was dispensable in other cells for the generation of an isotype-switched Ab response. Furthermore, in B p110δfl/fl mice the magnitude and output from GC reaction was intact. As there was no evidence for selection of nondeleted cells, we conclude that p110δ signaling in B cells is not essential for the GC magnitude. This was unexpected given the many reports, including our own, of defective signaling by p110δ-deficient B cells and challenges the widely held view that p110δ is the main PI3K isoform involved in B cell activation (46). These previous findings may reflect the key role of p110δ in the development of MZ B cells, as the in vitro studies using splenic B cell populations did not take account of the hyperresponsiveness of MZ B cells (47, 48) which were missing in the p110δ mutants. Similarly, previous suggestions of defective Ag presentation by p110δD910A B cells (49) may reflect the paucity of MZ B cells, which are known to be more effective at presenting Ags than follicular B cells (47). Indeed, we found Ag processing and presentation was enhanced in the absence of p110δ when Ag-specific B cells were tested. Our study also revealed that a B cell-intrinsic role of p110δ was to suppress class-switch recombination. This is consistent with PTEN inactivation in B cells inhibiting class-switch recombination (9) and the enhanced switching to IgE when p110δ activity is attenuated in vitro (29, 30). Taken together, the data show the nonredundant role of p110δ in B cells to control the differentiation or survival of the MZ and B1 B cell subsets and during the TD response to suppress Ig class-switch recombination. Other PI3K catalytic subunits, such as the p110α isoform that has been shown to be associated with CD19 after BCR stimulation, may contribute in a redundant manner to the GC reaction (6). Multiple priming/activation events are required for a successful GC reaction. First, T and B lymphocytes individually need to recognize Ag and initiate signaling through the TCR or BCR, respectively. In a second phase, the T and B cells home to the T cell–B cell border zone within secondary lymphoid tissues, form conjugates, and exchange signals that regulate selection and survival. Subsequently, continued interactions between B and T cells are required for the sustenance of the GC reaction. The T cell-intrinsic requirement for p110δ was characterized by a paucity of the TFH cell subset, which is specialized in providing help to B cells. Although p110δ has previously been shown to be important for FoxP3+ regulatory T cell function (50), the TFH cell defect is unlikely to be secondary to a defect in these cells since adoptively transferred regulatory T cells do not contribute to GC formation in the spleen (51). CD4+ T cells lacking p110δ could enter primary follicles but were substantially reduced in GCs. The downmodulation of surface expression of CCR7, a prerequisite for follicular entry, suggested that some early activation events in T cells were independent of p110δ. The importance of the signaling lymphocyte activation molecule (SLAM) family members CD84 and Ly108 for cognate interactions between TFH cells and GC B cells (52) led us to analyze their presence on CD4+ T cells; however, we found that their expression was p110δ-independent (data not shown). Deletion of p110δ after the initial priming event, by expression of OX40cre, suggested that TFH cells required the continual presence of p110δ. This finding may reflect the key role of p110δ in ICOS signaling. Our studies using hapten protein and SRBCs, both of which elicit ICOS-dependent GC responses, implicate p110δ as being an essential catalytic subunit for ICOS signaling. ICOS is a key cell-surface receptor regulating the generation and function of TFH cells. ICOS signals principally by recruitment of PI3K to the tyrosine within its cytoplasmic YFMF motif (40, 53). Mutation of this tyrosine has revealed the requirement for this interaction in the generation and function of TFH cells (23). The similarities between the recently reported ICOS-Y181F mutant and the T p110δfl/fl mice are striking. Both of these mouse models resemble ICOS knockout mice or ICOS inhibitory Ab treatment in terms of induction of TFH cells and the GC response (23, 26). The p110δ dependence of ICOS signaling suggests that p110α and p110β, which are expressed in T cells, are either quantitatively or qualitatively unable to substitute for p110δ. The latter possibility may reflect the growing awareness of selective recruitment and activation of PI3K isoforms by particular receptors. ICOS signaling is known to generate high levels of PIP3 (54) in the immunological synapse via recruitment of the p50α regulatory subunit (55). The selective requirement for p110δ downstream of ICOS signaling may reflect a preferential molecular association between p50α and p110δ, rather than p110α or p110β. We found that p110δ was required for ICOS-mediated increases in IL-21, IL-4, and c-Maf mRNA. These observations are in accordance with ICOS regulating c-Maf (43), which in turn regulates IL-21 (56) and IL-4 (42). Our data are consistent with results showing ICOS signaling regulates NFAT-dependent expression of cytokine genes in a PI3K-dependent manner (57) and with observations that Kruppel-like factor 2, which is suppressed by the PI3K pathway, attenuates IL-4 expression (58). The kinase GSK3 is known to be inhibited by ICOS costimulation (55) and to negatively regulate at least 50 target proteins, including several transcription factors that are critical for T cell effector functions and also molecules controlling cell growth and apoptosis (reviewed in Ref. 59). Thus, p110δ may orchestrate multiple transcription factor activities downstream of ICOS to control TFH cell function through GSK3β, which may be the nexus between PI3K signaling and downstream targets. The PI3K pathway also regulates the expression of the mutually antagonistic transcriptional repressors Bcl-6 and Blimp-1, which play a central role in TFH cell differentiation. p110δ was not required for the induction of Bcl-6 mRNA, and our data rather suggested that PI3K repressed Bcl-6 mRNA. This may reflect the loss of PI3K inhibition of the FOXO family of transcription factors, as these activate transcription of the Bcl-6 gene (60). The low levels of Blimp-1 mRNA in T p110δfl/fl T cells may further reflect the effect of the PI3K pathway on the Bcl-6–Blimp-1 axis that regulates TFH cell differentiation (21). Although p110δ may negatively regulate Bcl-6 mRNA levels, the increased Bcl-6 mRNA levels in T p110δfl/fl T cells is insufficient to overcome the requirement for p110δ during TFH cell formation in vivo. In summary, we propose that the amount of PIP3 generated is crucial for TFH cell formation and for optimal T cell help to B cells. This suggestion is supported by our observation that TFH cell numbers were reciprocally regulated by the p110δ-PTEN balance in activated T cells. The p110δ catalytic subunit is absolutely necessary for inducing the TFH cell lineage in vivo, thereby playing a dominant role among signal transduction pathways in the regulation of adaptive immunity. We thank the animal facility staff and Martin George for technical assistance and Geoff Morgan for FACS sorting. We also thank Drs. Michelle Linterman, Peter D. Katsikis, and Geoffrey Butcher for critically reading the manuscript. This work was supported in part by the Biotechnology and Biological Sciences Research Council and the Medical Research Council. 1994. Germinal centers. Annu. Rev. Immunol. 12: 117–139.
. 2007. Germinal-center organization and cellular dynamics. Immunity 27: 190–202.
. 2009. Fine tuning the immune response with PI3K. Immunol. Rev. 228: 253–272.
. 2002. A crucial role for the p110δ subunit of phosphatidylinositol 3-kinase in B cell development and activation. J. Exp. Med. 196: 753–763.
. 2002. Impaired B and T cell antigen receptor signaling in p110δ PI 3-kinase mutant mice. Science 297: 1031–1034.
. 2004. Vav-dependent and vav-independent phosphatidylinositol 3-kinase activation in murine B cells determined by the nature of the stimulus. J. Immunol. 173: 3209–3214.
. 2006. Key role of the p110δ isoform of PI3K in B-cell antigen and IL-4 receptor signaling: comparative analysis of genetic and pharmacologic interference with p110δ function in B cells. Blood 107: 642–650.
. 2008. B-cell responses to B-cell activation factor of the TNF family (BAFF) are impaired in the absence of PI3Kδ. Eur. J. Immunol. 38: 3543–3548.
. 2006. Regulation of class-switch recombination and plasma cell differentiation by phosphatidylinositol 3-kinase signaling. Immunity 25: 545–557.
. 2007. T-cell function is partially maintained in the absence of class IA phosphoinositide 3-kinase signaling. Blood 109: 2894–2902.
. 2006. The p110δ isoform of phosphoinositide 3-kinase controls clonal expansion and differentiation of Th cells. J. Immunol. 177: 5122–5128.
. 2006. Cutting edge: T cell requirement for CD28 costimulation is due to negative regulation of TCR signals by PTEN. J. Immunol. 177: 4262–4266.
. 2006. 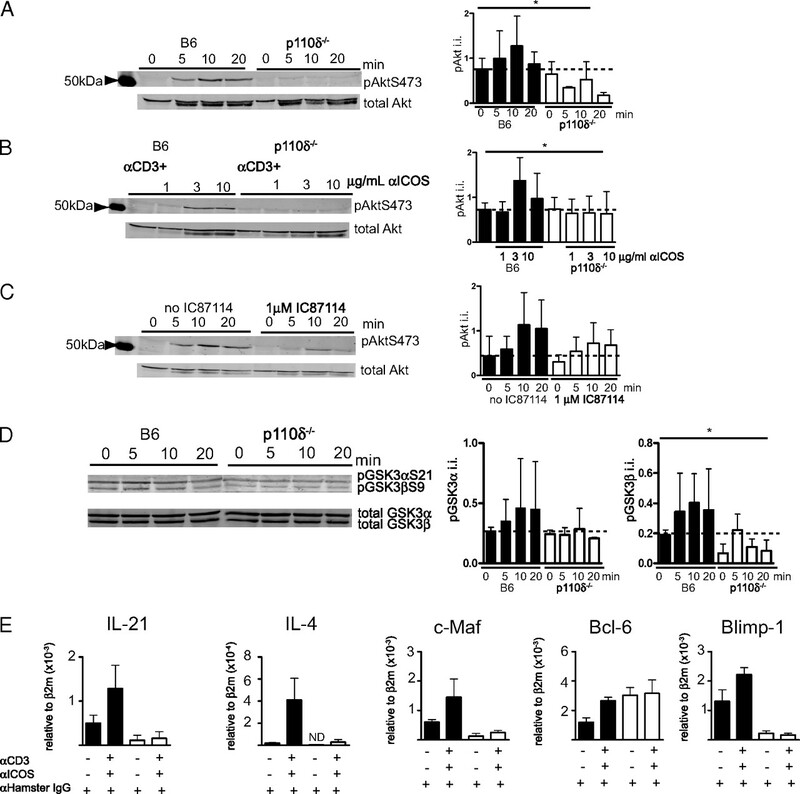 Inhibition of phosphoinositide 3-kinase δ attenuates allergic airway inflammation and hyperresponsiveness in murine asthma model. FASEB J. 20: 455–465.
. 2008. Role of PI3Kδ and PI3Kγ in inflammatory arthritis and tissue localization of neutrophils. Eur. J. Immunol. 38: 1215–1224.
. 2009. Follicular helper T cells: lineage and location. Immunity 30: 324–335. 2009. New insights into the differentiation and function of T follicular helper cells. Nat. Rev. Immunol. 9: 757–766.
. 2000. Follicular B helper T cells express CXC chemokine receptor 5, localize to B cell follicles, and support immunoglobulin production. J. Exp. Med. 192: 1545–1552.
. 2009. The transcriptional repressor Bcl-6 directs T follicular helper cell lineage commitment. Immunity 31: 457–468.
. 2009. Bcl6 mediates the development of T follicular helper cells. Science 325: 1001–1005.
. 2009. Bcl6 and Blimp-1 are reciprocal and antagonistic regulators of T follicular helper cell differentiation. Science 325: 1006–1010.
. 1999. In vivo-activated CD4 T cells upregulate CXC chemokine receptor 5 and reprogram their response to lymphoid chemokines. J. Exp. Med. 190: 1123–1134.
. 2009. Inducible costimulator promotes helper T-cell differentiation through phosphoinositide 3-kinase. Proc. Natl. Acad. Sci. USA 106: 20371–20376.
. 1993. Processing of endogenously synthesized hen egg-white lysozyme retained in the endoplasmic reticulum or in secretory form gives rise to a similar but not identical set of epitopes recognized by class II-restricted T cells. J. Immunol. 151: 3576–3586.
. 2000. Germinal centers without T cells. J. Exp. Med. 191: 485–494.
. 2005. The role of ICOS in the CXCR5+ follicular B helper T cell maintenance in vivo. J. Immunol. 175: 2340–2348.
. 2007. Role of CXCR5 and CCR7 in follicular Th cell positioning and appearance of a programmed cell death gene-1high germinal center-associated subpopulation. J. Immunol. 179: 5099–5108.
. 2008. PI3K is a negative regulator of IgE production. Int. Immunol. 20: 499–508.
. 2008. Genetic or pharmaceutical blockade of p110delta phosphoinositide 3-kinase enhances IgE production. J. Allergy Clin. Immunol. 122: 811–819.e2.
. 1988. Altered immunoglobulin expression and functional silencing of self-reactive B lymphocytes in transgenic mice. Nature 334: 676–682.
. 1998. CD4 T cell cytokine differentiation: the B cell activation molecule, OX40 ligand, instructs CD4 T cells to express interleukin 4 and upregulates expression of the chemokine receptor, Blr-1. J. Exp. Med. 188: 297–304.
. 2009. Thymic OX40 expression discriminates cells undergoing strong responses to selection ligands. J. Immunol. 182: 4581–4589.
. 2009. Molecular mechanism and function of CD40/CD40L engagement in the immune system. Immunol. Rev. 229: 152–172.
. 2010. IL-21 regulates germinal center B cell differentiation and proliferation through a B cell-intrinsic mechanism. J. Exp. Med. 207: 365–378.
. 2010. IL-21 acts directly on B cells to regulate Bcl-6 expression and germinal center responses. J. Exp. Med. 207: 353–363.
. 1999. ICOS is an inducible T-cell co-stimulator structurally and functionally related to CD28. Nature 397: 263–266.
. 2008. Generation of T follicular helper cells is mediated by interleukin-21 but independent of T helper 1, 2, or 17 cell lineages. Immunity 29: 138–149.
. 2005. A RING-type ubiquitin ligase family member required to repress follicular helper T cells and autoimmunity. Nature 435: 452–458.
. 2000. The CD28-related molecule ICOS is required for effective T cell-dependent immune responses. Immunity 13: 95–105.
. 2002. A co-stimulatory molecule on activated T cells, H4/ICOS, delivers specific signals in Th cells and regulates their responses. Int. Immunol. 14: 555–566.
. 1996. The proto-oncogene c-maf is responsible for tissue-specific expression of interleukin-4. Cell 85: 973–983.
. 2003. Transcriptional regulation of Th2 differentiation by inducible costimulator. Immunity 18: 801–811.
. 2009. The p110δ isoform of phosphatidylinositol 3-kinase controls susceptibility to Leishmania major by regulating expansion and tissue homing of regulatory T cells. J. Immunol. 183: 1921–1933.
. 2000. The conserved phosphoinositide 3-kinase pathway determines heart size in mice. EMBO J. 19: 2537–2548.
. 2010. PI3K inhibition in inflammation: toward tailored therapies for specific diseases. Bioessays 32: 185–196.
. 2004. Marginal zone, but not follicular B cells, are potent activators of naive CD4 T cells. J. Immunol. 172: 803–811.
. 1997. Marginal zone B cells exhibit unique activation, proliferative and immunoglobulin secretory responses. Eur. J. Immunol. 27: 2366–2374.
. 2007. Requirement for phosphoinositide 3-kinase p110δ signaling in B cell antigen receptor-mediated antigen presentation. J. Immunol. 178: 2328–2335.
. 2006. Cutting edge: the phosphoinositide 3-kinase p110δ is critical for the function of CD4+CD25+Foxp3+ regulatory T cells. J. Immunol. 177: 6598–6602.
. 2009. Preferential generation of follicular B helper T cells from Foxp3+ T cells in gut Peyer’s patches. Science 323: 1488–1492.
. 2010. Optimal germinal center responses require a multistage T cell:B cell adhesion process involving integrins, SLAM-associated protein, and CD84. Immunity 32: 253–265.
. 2003. A single amino acid alteration in cytoplasmic domain determines IL-2 promoter activation by ligation of CD28 but not inducible costimulator (ICOS). J. Exp. Med. 197: 257–262.
. 2003. CD28 and inducible costimulatory protein Src homology 2 binding domains show distinct regulation of phosphatidylinositol 3-kinase, Bcl-xL, and IL-2 expression in primary human CD4 T lymphocytes. J. Immunol. 171: 166–174.
. 2008. ICOS ligation recruits the p50α PI3K regulatory subunit to the immunological synapse. J. Immunol. 181: 1969–1977.
. 2009. The costimulatory molecule ICOS regulates the expression of c-Maf and IL-21 in the development of follicular T helper cells and TH-17 cells. Nat. Immunol. 10: 167–175.
. 2007. A costimulation-initiated signaling pathway regulates NFATc1 transcription in T lymphocytes. J. Immunol. 179: 1096–1103.
. 2009. KLF2 transcription-factor deficiency in T cells results in unrestrained cytokine production and upregulation of bystander chemokine receptors. Immunity 31: 122–130.
. 2010. Innate and adaptive immune responses regulated by glycogen synthase kinase-3 (GSK3). Trends Immunol. 31: 24–31.
. 2004. FoxO3a and BCR-ABL regulate cyclin D2 transcription through a STAT5/BCL6-dependent mechanism. Mol. Cell. Biol. 24: 10058–10071.